If you are very obese and have trouble losing weight through dieting and exercise, your doctor may consider you as a candidate for gastric bypass surgery to achieve weight loss. Candidates usually are 100 pounds or more over their ideal weight. Gastric bypass involves reducing the size of your stomach, then connecting part of your small intestine in a way to allow food to bypass most of your stomach so your body absorbs fewer calories when you eat. You also will feel like eating less since your smaller stomach will feel full with less food. Traditional open surgery requires a large incision in your abdomen, so the surgeon and directly operate on your stomach and intestine. Laparoscopic surgery is a less invasive surgery wherein 4, 5 or 6 small incisions are made in your abdomen, and a laparoscope with a tiny TV camera is inserted into your belly so the surgeon can see your organs. Tiny surgical instruments are then inserted into the other incisions to perform the surgery. This method usually results in a quicker hospital stay and recovery time. 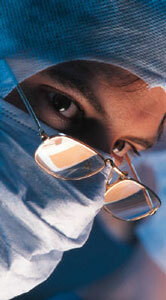 Your surgeon will decide which method is best for you based on your condition and health. If you are very overweight (over 350 pounds) or have heart or lung disease or a history of previous abdominal surgery, open surgery may be your best option. It takes about 4 hours to perform gastric bypass surgery. In gastric bypass surgery, the objective is to reduce the size of your stomach, so you feel full when eating less and your body is less able to absorb food. The surgeon will divide your stomach into two sections using surgical staples, so the food you eat is contained only in a small upper section that can only hold an ounce of food. A small hole is made in this upper section, and to it the surgeon connects a bypass to a part of your small intestine known as the jejunum. Food you eat will now bypass most of your stomach and the upper part of your small intestine, so fewer calories can be absorbed by your body. During gastric bypass surgery, you are given general anesthesia so during surgery you are unconscious and cannot feel pain. Your surgeon will meet with you to judge if you are a candidate, and to review the risks involved with a major surgery like gastric bypass surgery. Your stomach and intestines may be injured or following surgery the surgical staples put in your stomach may leak, or your smaller stomach may have problems, requiring a second surgery. The evening before surgery you will not eat or drink anything. You will stay for 3 to 5 days in the hospital. You will take pain medicine by pills or an intravenous drip. Walk a little the day after you have surgery. Avoid eating anything solid or liquid for a day or two. Begin eating liquid or soft foods first. A catheter (tube) may be used for a while to drain fluids from the lower part of your stomach that was bypassed by the surgery. To prevent blood clots from forming in your legs, you may wear special stockings or receive shots with medications. Once you can eat liquid or soft foods, and move with pain, you are eligible to go home. You will need to readjust your eating habits since your stomach is smaller. Some patients eat more than their smaller stomach can handle and throw up. You will follow a recommended diet and exercise plan. You will lose 10 to 20 pounds in weight the first year if you are like most people who have gastric bypass surgery. Your lifestyle activities may improve once you lose weight as you find it easier to move around.